There are a number of dental services that can be performed by cosmetic dentists, some of which possibly being more elective than others. Still, it’s important to know what cosmetic dentistry is, why you may need it and when to visit your dentist. Essentially, cosmetic dentists deals with any sort of oral care that helps to fix any unwanted or even potentially dangerous issues with the teeth, which may prevent you from possessing the smile that you have always wanted. This type of dentistry can be broken down into two different fields—prosthodontics and orthodontics. When you visit a dentist for such services, you will generally be seeing them to address teeth whitening, misshapen, missing or worn/broken teeth in your smile. These issues can generally be fixed in a timely manner with placement of crowns, veneers, bridges or implants. Orthodontics, on the other hand, is focused on correcting alignment and crowding issues that prevent that perfect smile. Over time, braces can be used to straighten teeth, close spaces, and correct bite patterns. 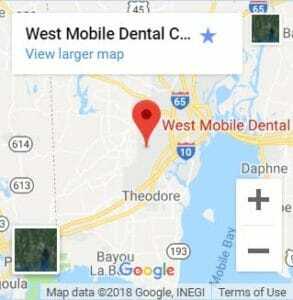 West Mobile Dental Care is conveniently located in Mobile, Alabama but proudly services Daphne, Prichard, Montrose, Fairhope, Tillman’s Corner and other neighboring communities. Is This Type of Dentistry Necessary? While some dental services are more pressing than others, cosmetic dentistry is often necessary to achieve proper aesthetics. When Should I See a Dentist About Aesthetic Dentistry? Any of the situations that were mentioned above should warrant a call to your cosmetic dentist about what options are available to address your personal concerns. While some of these issues may be less drastic and time sensitive than others, it’s still a good idea to look at treatment solutions, and to have your health care professional take a look to see if the problem may get progressively worse. We Can Help You With The Smile You Deserve with our Advanced Cosmetic Dental Procedures! Call our office at (251) 666-3600 Today! What Are Some Examples of This Type of Dentistry? Cosmetic dentistry—while used to explain a type of dentistry—is still a catchall term. There are many different procedures that fall under this umbrella that fix a variety of different issues. Here are some of the different forms of dentistry and their appropriate applications. When you have a chipped, severely stained or slightly rotated front tooth a veneer can be placed to realign the tooth into your smile. When appropriate, veneers also can be placed on multiple teeth to close spaces that may exist. Veneers cover the front surface and tip of the teeth and are generally made from a strong porcelain. Porcelain veneers are custom made for each patient in a lab setting. Like veneers, dental bonding is intended for teeth that do not need to be pulled and have healthy roots below the gum-line. If you have a cracked, chipped or decayed tooth, dental bonding may be a good fit for you. With a dental bonding procedure, a composite resin (tooth colored) filling material is applied to the existing tooth surface to create a functional and natural looking tooth that blends in with your smile. This procedure is less invasive than porcelain veneers and can often be completed in one session. While dental crowns still fall under the title of “cosmetic” dentistry, they are generally used when a significant portion of the tooth is missing due to fracture or decay and a full coverage restoration is needed to ensure its longevity. The process involves a installing a crown or “cap” on top of the injured tooth that not only resembles the tooth that it is covering, but also functions close to the same way. Sometimes teeth are damaged to the point where they need to be removed. When a tooth is extracted, a replacement needs to be installed to ensure the health of the surrounding teeth and to preserve a normal bite pattern. This options is literally meant to “bridge” the gap between a missing tooth or teeth with a fixed and cemented prosthetic appliance. The false tooth that is part of the dental bridge appears as if it is emerging from the bone. Dental implants are used to treat the loss of teeth. With implants the new tooth or teeth are installed by placing a titanium implant that mimics a metal tooth root into the jaw. Following a healing period when the dental implant integrates into the bone, our team will place a custom-made crown on top of the implant. This is a great alternative to bridges, but they can only be installed if the integrity of the jawbone is still strong. Therefore, it is important to have any tooth injury taken care of immediately. Whether they are traditional wire braces, or clear, plastic Invisalign trays, Orthodontics serves the function of adjusting the placement and alignment of teeth. If you have teeth that are rotated/crowded, you have gaps in your teeth or you have an overbite/deepbite, braces can help to realign your teeth in a manner that does not require a drill. This will both improve the function of your mouth, as well as your smile! In some circumstances oral health care specialists may work together to coordinate treatment if you have a more extensive case requiring both orthodontics and prosthodontics. Cosmetic Dentists also provide teeth whitening, restorations, porcelain and composite crowns, smile design, full mouth reconstruction, gum grafting, basically anything to help you regain confidence in your smile.